As we reported here, the Go Hillsborough campaign, behind closed doors and without any governing approval to do so, decided to double down and expand the size and scope of their effort. We had no idea they wanted to expand to Los Angeles. At the latest Go Hillsborough meetings, what appears to be a video is continuously run on a screen for the public to view throughout the meeting. I asked the county for a copy of the video and if the same video was being shown at all the meetings. I received a response from the county that the video was a Powerpoint deck that continues looping at the Go Hillsborough meetings. I was provided a link to the Powerpoint deck Understanding the Issues Powerpoint Loop that is posted on the GoHillsborough.org website. Like Go Hillsborough's claim about Tampa Bay traffic congestion that we debunked here, there are NO source or source data cited for ANY claims made in the Go Hillsborough Powerpoint presentation. We're paying hefty Parsons Brinckerhoff "transportation expert" consulting rates for the Go Hillsborough campaign. For an effort that is costing taxpayers almost $1.5 million, we expect factual, substantiated information be presented to the public and our elected officials. However, it appears what is being shown at the Go Hillsborough meetings does not match the Powerpoint deck on their own website. I have asked the county if there is another Powerpoint deck being shown at these meetings but have not yet received any response back to that question. This picture is being shown at Go Hillsborough meetings but is not in the Powerpoint deck. 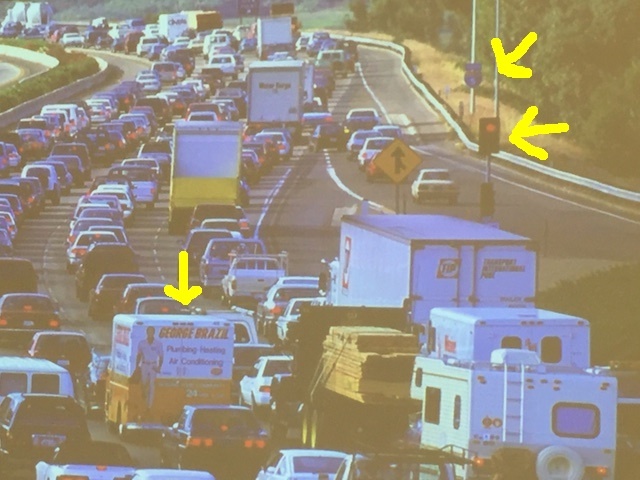 We must assume this picture is shown to supposedly show traffic congestion in Hillsborough County. However, there is a problem with this picture. This is NOT a picture of traffic in Hillsborough County, the Tampa Bay area or even in the state of Florida. Is Go Hillsborough now including Interstate 5 in Los Angeles in "their" plan? This is a picture of Interstate 5 in LA that runs the entire west coast of the United States from the Mexican border to the Canadian border. How do we know this is Interstate 5? We highlighted with yellow arrows three things in the picture that tell us. 2. We were in CA this past spring and their interstates use red lights with their on ramps. No interstate in the Tampa Bay, perhaps even Florida, uses red lights on our interstate on ramps. 3. There is a "George Brazil" plumbing truck in the foreground. A simple Google search of their website confirms this plumbing company operates in the LA area. Who added pictures to the Go Hillsborough presentation posted on their website? Are there multiple presentation decks? Who created these presentations? A transportation expert or a PR firm? Was there any oversight from the county? Who at County Center is responsible for overseeing content used by Go Hillsborough? Why would Go Hillsborough deceptively show a picture of traffic in LA insinuating it is traffic in Hillsborough County? Because the Go Hillsborough process is bad and a bad process creates a bad product. Because the product of the Go Hillsborough campaign was always another huge sales tax increase. But according to their own polling, there's no desire for a huge sales tax hike. And when you cannot sell a bad product to the public, you "try" to deceive them. Good job Sharon, keep up the heat! We buses believe that HART needs privatization...right now! Build TBX too...our real transportation solution!